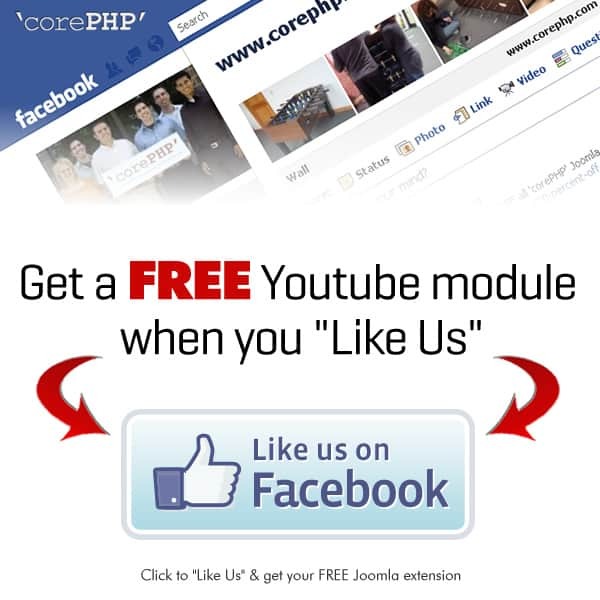 From now until November 15th, when you visit our Facebook page and “Like Us”, we’ll give you our popular Youtube module for Joomla for FREE! Our Youtube module makes it super-easy to post YouTube videos anywhere on your site in a variety of sizes & colors AND from a variety of authors, channels and playlists—without having to edit a single line of html code. It’s flexible & easy to configure and looks great on any site. But the best part? It’s FREE when you stop by our Facebook page this week and click the “LIKE” button at the top of the page. This special offer ends November 15th, so please visit our Facebook page and “Like Us” today. This entry was posted in Uncategorized and tagged Facebook, youtube, Youtube for Joomla, Youtubefor Joomla on November 1, 2011 by The Core Team. I clicked “I like you” on FB before 15. Nov. but I can’t donwload it on my ipad. So where can I get my free version? Please contact us at support@corephp.com and we can assist you further thru there.